Exr-IO offers a variety of options when writing OpenEXR files. In most cases the created images will be fine with the default options and changes should only be necessary for specialized uses or to fix rare problems. The dialog can be disabled with the ‘Always show this dialog’ checkbox to save images faster without manual confirmation. In the case any options become relevant in the future the hidden dialog can be re-enabled with a button in the Exr-IO information window (Help -> About Plug-ins -> Exr-IO). This specifies the color depth and channel type used to store the image information in the OpenEXR file. Depending on the color depth of the image in Photoshop and the selection for the file the image data will be converted and corresponding loss of detail might occur. Photoshop’s image modes that use less than 32 bits per channel are integer based. Saving them as HALF or FLOAT images will convert their color range to the default 0.0 to 1.0 intensity range. Saving a 16 bit Photoshop image into EXR’s HALF type will incur loss of detail that can become noticeable in exceptional cases. Saving the image as UINT will just scale it up to the whole 32 bit range. 32 bit images in Photoshop will be stored as they are when the FLOAT type is selected. HALF will incur a significant loss of detail but still cover the whole color range past the color intensity of 1.0. UINT will result in a conversion of the default intensity range to integers. Any pixel color intensity past 1.0 will get lost in the conversion. Exr-IO supports all default OpenEXR compression methods. See OpenEXR Data Compression for details. 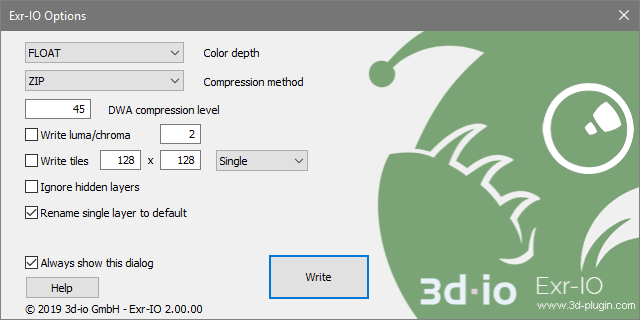 This specifies the compression level for the DWAA and DWAB compression methods. It is ignored for all other compression methods. See OpenEXR Data Compression for details. Photoshop layers are normally written as individual red, green, blue (and alpha) channels into the OpenEXR file. If this option is selected the pixel colors are converted into separate luminance and red and blue chroma channels. The number next to the option allows a user-selectable sampling rate for the chroma channels. Storing images with luminance and chroma channels allows for a significantly reduced amount of required storage space. With a sampling rate of 2 only half the image size (without further compression based on the compression method) is required. Higher sampling rates will incur an increasing loss of image quality. A sampling rate of 1 will require the same space as the RGB image but due to the color format conversion minor rounding errors may occur. OpenEXR can store image data either as a whole in rows of pixels or as a collection of individual rectangular tiles. This option allows to select storing in tile mode with arbitrary rectangle dimensions. When the image is stored as tiles each tile may also store additional resolution levels (Mipmap or Ripmap) which can be accessed individually by programs that read the OpenEXR file. Specifies if channels that are currently hidden in Photoshop are written to the file or not. Exr-IO stores layer information about Photoshop’s layers. If hidden layers are written to the file they will still be hidden when the file is opened again with Exr-IO. Exr-IO uses Photoshop’s layer names to determine channel names in the OpenEXR file. Many programs that read OpenEXR files can only handle a single image layer that follows the default naming convention and include at most one channel each for red, green, blue and alpha that are labeled correspondingly R, G, B and A. If the Photoshop image has only a single layer Exr-IO will produce such a file and omit the layer’s name to improve compatibility with single-layer readers for OpenEXR files. The resulting channels will be named as if the Photoshop layer was named ‘RGBA’. If this option is deactivated the single layer’s name will not be discarded. If multiple Photoshop layers are written no layer will be renamed.